Thomas Kulesia, II, the founder of No Coast Design in Elkhart, Ind.—the self-proclaimed “RV capital of the world”—once had visions of becoming an architect. He even enrolled in the architecture program at Texas Tech University in Lubbock. But the reality of the structures he knew he would eventually spend of his time designing, meaning schools, hospitals and other institutional facilities, became harder and harder for him to accept. Eventually, he left the program and returned to Indiana. Kulesia’s time at Texas Tech wasn’t wasted—far from it, in fact. There he discovered his passion for and the importance of creating visual, computer-generated graphics/renderings for the buildings he wanted to design. As you can see in the photo above. Kulesia’s vision was realized in the SV 50’s final graphics executive. Today Kulesia, now 33 years old, designs graphics for high-performance powerboats, recreational vehicles and aircraft through No Coast Design, the company he started in 2009 after spending a total of three years working for famed go-fast boat graphics designer and airbrush man Dean Loucks, the founder of The Art Of Design, which also is in Elkhart. 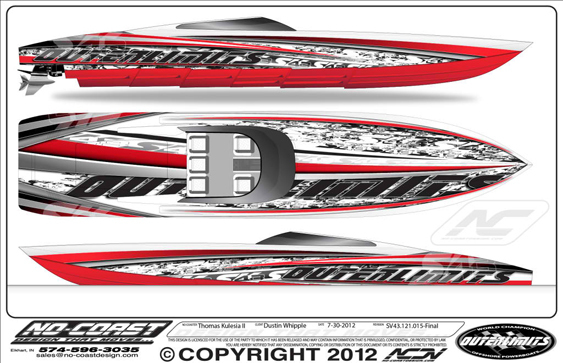 The design of the graphics for Dustin Whipple’s Outerlimits SV 43 was among the complicated Kulesia has ever created. 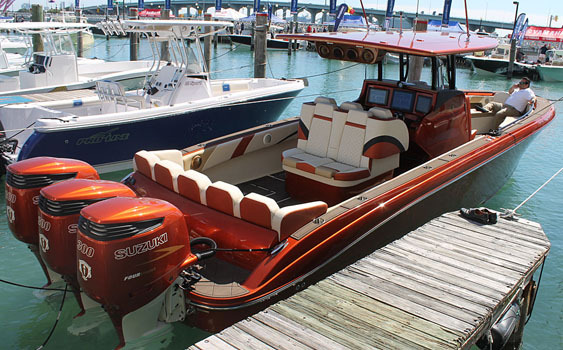 Unlike the noted Boat Customs, The Art Of Design and Visual Imaginations—three of the best-known high-performance boat custom paint outfits in the country—No Coast Graphics does not have its own in-house paint shop. 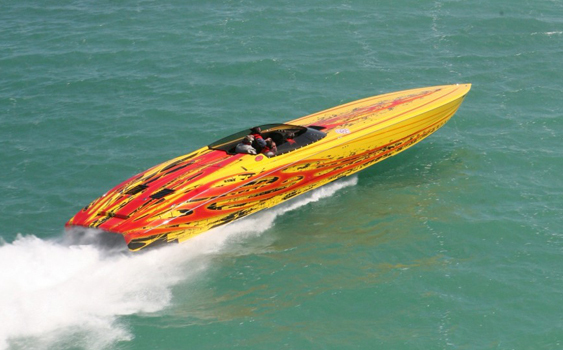 While Kulesia has designed graphics and created the vinyl stencils needed to apply them for Outerlimits and Mystic in his 2,000-square-foot facility, both of those companies have contracted other go-fast boat painters or handled the actual painting in house. At this point in his career, Kulesia has no interest in taking on the expense and management responsibilities that having his own paint shop would require. And thanks to his relationship with nearby Herremans Paint, which specializes in painting motorhomes and an assortment of other large vehicles, he doesn’t have to. While Kulesia has created a number of graphic designs for “30 to 40” motorhomes that Herremans has painted, the two outfits recently finished their first collaborative effort on a full-size offshore, the complete graphic refreshment of a 52-foot Outerlimits. Kulesia hopes to do more work—as in a lot more—where he designs performance-boat graphics and Herremans, which has three 60-foot “downdraft” paint booths, applies them. 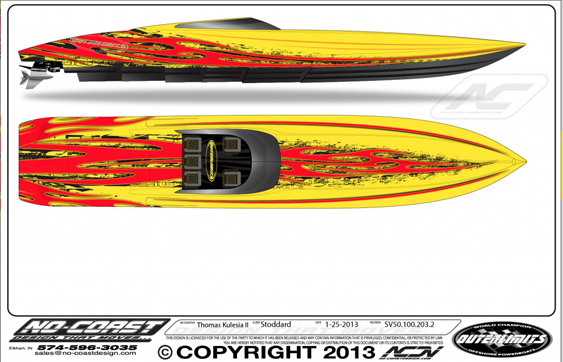 As for the general challenge of designing graphics for go-fast boats, Kulesia said it’s much more challenging than creating graphics for motorhomes. Arriving at a final graphics design for a boat could require a slew of preliminary and developmental designs, he explained. “A motorcoach is like a big, blank canvas—almost anything will look good on it,” Kulesia said. “But with a boat you’re ‘fighting’ all the curves and lines. Mystic, Outerlimits, Skater—they all have their own idiosyncrasies. They all have their own character. And airplanes are even harder. They’re opposite of boats. They start fat and get skinny. I haven’t completely figured them out yet, but my relationship with [custom aircraft paint shop]Flying Colors is another good one I have in the Midwest.